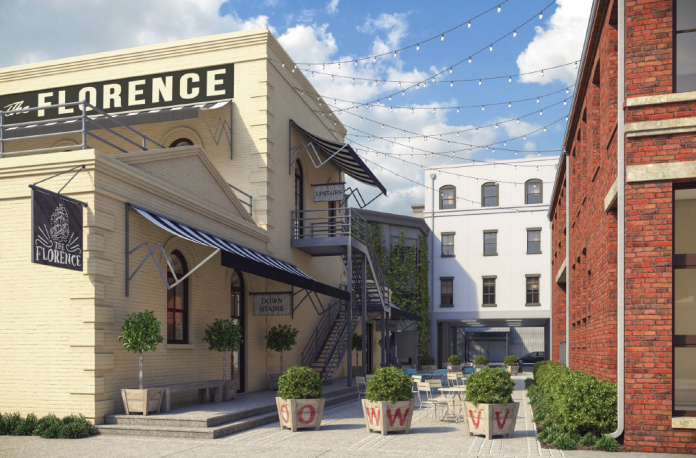 Good news: more details have surfaced on Hugh Acheson’s next restaurant, the Florence. The chef/owner is expanding to Savannah in a historic building at One West Victory Drive with an Italian restaurant. Acheson hopes to open in May, and Kyle Jacovino, previously of Acheson restaurants Five & Ten and Empire State South, will be the executive chef. Yes, we are Italian-focused restaurant, but there’s a kinship between Italian and Southern food and culture. Let’s look at how things work in Italy. Every day they wake up, talk to farmers, bakers, salumerias and then may hit up the cafe for an espresso. Over there this is just a way of life—an everyday thing—and it’s not a trend. But that’s what we’re also about at the Florence: local food, great coffee, humble service, and community. Sure, we cook Italian food, but we’re using Southern ingredients and keeping our food in the simplest form, yet handled with tremendous care. The statement went on to name several dishes that illustrate the style of cooking Acheson and Jacovino are working toward. These include a half chicken cooked on a wood-fired grill with whole roasted tomatoes, confit baby potatoes, and dandelion greens; and pastas ranging from carbonara with cured bacon to a Sicilian-based stew using local seafood and shellfish with tiny, little anelli’s (tiny ring-shaped pasta). There will be pizzas cooked in ninety seconds in an oven hand-built by a mason in Naples, Italy, and “beautiful, simple desserts” like panna cotta with local peaches and aged balsamic vinegar. I spoke with Acheson who further explained what to expect from the Florence. When you use Southern ingredients for Italian fare, what do you end up with? There will be three to four pizzas, and a lot of extruded pastas and hand-cut pastas, small plates, appetizers, contorni’s or sides like stewed chickpeas, and an extravagant main course section. We’re still working on the menu. It will be like all of the restaurants—moderate but can be deemed fine dining or deemed a place you go for a quick pizza and a beer. We’re serving dinner six days a week. Tell me about the bar. What’s the focus? Italian cocktails: a lot of amaro and vermouth and sherry. Sherry and port and Madeira and vermouth have a big history in Charleston and Savannah as port cities. We’ll focus on lighter, hot weather cocktails. Of course, we’ll have an Italian wine program and local beers. Kelly Thorn from Empire State South is setting it up. We haven’t figured out who is leading it yet. Alli Crumpton from Empire State South will be the general manager and wine director. We’ll have about 100 to 120 in the collection with seven or eight whites and seven or eight reds by the glass, rotating heavily. There will be some pretty obscure wines from Italy. The bar upstairs is a place people will want to go and spend happy hour. It’s a good congregation place, and we’ll have a bar menu with more funky sandwiches, pizzas, a lot of antipasti type stuff—smaller snacks and things to share. How is the space laid out? The main dining room seats eighty. There’s a bar upstairs where you can have private dining for thirty-six and an upstairs patio. The coffee shop downstairs is kind of like at Empire State South but cornered off from the restaurant. It’s right next to a complex with SCAD students and right on a courtyard with [public] seating. The coffee program will be mostly to go; people can get a coffee and hang out in the piazza. We only have four to eight seats inside. It’ll just be pour-over and espresso, similar to Empire. What will the atmosphere at the Florence be like? Less wood than Empire. It looks almost art deco-y inside. It’s being designed by Lisa Ellis, who designed Empire State South. We’re using a lot of reclaimed materials, handmade tables, cool seating, banquettes, beautiful old mirrors, and things like that. We’ll have different seating styles: custom banquettes, leather and wood chairs, and funky wrought iron bar stools. It’ll be a good eclectic mix that makes you want to look around. Why Savannah? Everyone always asks when I’ll open in Vegas or New York. Those are great cities, but they have great dining options already. Here, we can look in our own backyard. Savannah is an amazingly beautiful city. It can use a couple more restaurants that are serving great food. There’s not much down there that does what I do. We’re in a historical neighborhood. Back in the Day Bakery is two blocks away. There’s a lot of local genius happening in this area. We’re about a half-hour walk from the park. The tourist crowd will have to come to us. We’ve always been somewhat of a destination dining. I think people will be happily inconvenienced by the destination. So are you considering opening additional restaurants in the area? There are a lot of little markets we’re slowly but surely looking at, but nothing’s concrete yet. Macon, North Georgia, way down South—I love Thomasville, Ga. It’s a small but really cool community. But they have to have enough of an economic engine to support what we do. Anything else we should know? We’ve changed our policy at all the restaurants to compensate for how people want to dine now. We save half the room for walk-ins. This encourages hanging out and enjoying.